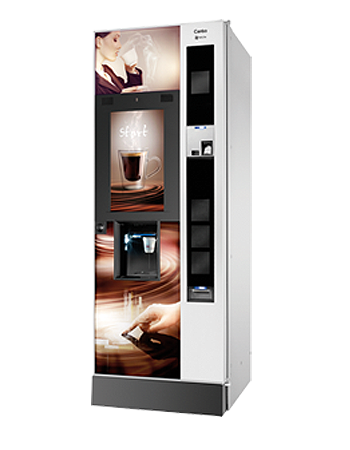 The Canto is a top end and cutting edge coffee vending machine offering a mixture of exceptionally high quality drinks and ultra modern technology. A wide range of coffees are available including cappuccino, latte, espresso, cafe au lait and mocha. In addition freshly brewed tea, indulgent, frothy hot chocolate and decaffeinated coffee are also dispensed through the Canto. There is a choice of drink sizes as both 7oz and 9oz cups can be accommodated. As with all of the N & W range of vending equipment a variety of payment methods are available ranging from cashless to full change giving coin mechanisms as well as the Zip Key system which allows for a limited amount of free or subsidized drinks for staff. This is a good way for an employer to give something away to staff whilst ensuring that their generosity is not abused. The 21.5″ touch screen is another area where the Canto leaves the competition behind. It allows for promotional videos to be shown as well as live news or RSS feeds as well as giving the user the chance to fully customize their drink selection (just like a high street coffee experience). There is also sound available as well as a movement infra red sensor which makes using the Canto an incredibly interactive experience. As with the other floor standing hot drinks machines we offer a fully managed service which means that our operators visit to keep the equipment filled and cleaned for you. Delivery, installation, training (where necessary) and full technical support is all included.